It's hard to stand out in this world. It's hard to make a name for yourself, to become something, to prove that you are worth it, to show that you can do it. You see people walk into work everyday; all in suits, all trying to accomplish the same thing: success. But what is success really? Is it making a ton of money? Is it living comfortably and debt free? Is it being surrounded by family? We all have a different meaning of what success is but the one thing I think we can all agree on is that we all want to be…something and achieve something. Something that is more than a suit walking into work, something that is more than a name on a paycheck, something that is more than the grades on a report card, something that is more than a test score, or grade point average. We all want to be recognized, noticed, cherished, loved, cared for, and appreciated. The problem? We are surrounded by a society that prefers cupcakes. Something that is so different, so far fetched that it is almost insurmountable. Everyday people work extremely hard, they dedicate themselves to a goal of achieving insurmountable success. There are cupcakes in the world, those that worked up from nothing, dedicated themselves to their work or family, those that made it to the top. The key is knowing how to do this; how to become a cupcake. Everyday I try to figure out what I can do to make it…what I need to do to make it. I obviously haven't figured it out yet, as I'm still living paycheck to paycheck, splurging on chic-fi-la, cherishing the minimal time I have with family. I'd like to think I am at the chocolate chip muffin stage. The question is, how can I become a cupcake? I think about my ultimate goal in life. I can picture it in my head, see it in my near future, and that is what keeps me going. I will never give up. I refuse to give up…I want it too bad. To all those wanting to be something, I am here to tell you that you can be whatever you'd like. It may at times feel like you have no support, that you are a lone muffin, but you are not. 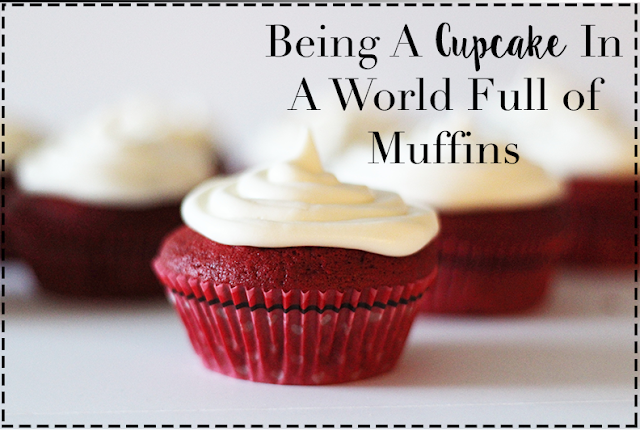 We are all muffins, unique with a different taste, but we all want to be a cupcake. A cupcake with sprinkles, frosting, the works…the cupcakes that are placed in the window of a pastry store…the ones that get recognized.